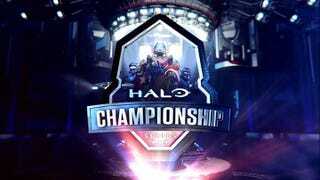 For Halo fans and eSports fans alike, the wait is nearly over: it’s championship week. The Halo World Championship (HCS) is upon us, with group play on from March 18-19 and the finals on March 20 (official info here). Up for grabs is $2.5 million in prize money, with a full $1 million going to the winning team. It’s sure to be an exciting weekend, and I’d strongly encourage you to check it out if you’ve yet to catch any Halo eSports (my first experience was certainly memorable). The 16 teams competing in the world championship. It’s well-known in the Halo community that the best Halo teams tend to be based somewhere in North America. While all the regional qualifying tournaments around the world featured some fantastic competitive moments, the most impressive displays of skill were showcased at the North American regional qualifying finals. Eight of the sixteen teams in the HCS are from North America, and it wouldn’t be shocking if most of the eight quarterfinal spots are eventually filled by those teams. Denial player ‘Huke’ was a revelation in the regional tournament. Going into the NA regional qualifying tournament, the young team Denial wasn’t even expected to make it out of group play. The entire tournament was shocked when they not only qualified for the world championship (defeating Halo icons like Ogre2 in the process) but proceeded to knock out #1 seeded Allegiance in the semifinals to face off against CLG in the regional final. They eventually fell in the final, but they quickly became fan favorites in the process as their young, previously-unknown players wowed with incredibly-skilled plays against seasoned veterans. They caught everyone by surprise and took the tournament by storm. They won’t have the luxury of being unknown when they hit the biggest stage this week, though. Everyone will be looking out for them, and they’ll face a new challenge of continuing their surprising success under the weight of new expectations. While I see a potentially-bright future for this team and its exciting players, I expect them to falter against more experienced teams this week who’ve excelled under enormous pressure. When an entire crowd starts chanting the ridiculous-sounding name “bubu dubu” in the finals of NA regionals, you know the gameplay must have been sick. From overkill-freakouts to ridiculous no-scopes, the NA regionals had it all. Expect more of the same this weekend. Will he ever get his first event win? Probably not at the HCS. Watching iconic player Brett ‘Naded’ Leonard continue to seek his first event win in Halo since joining the pro scene in 2006 has become become pretty painful, as he’s now been labeled as one of the best Halo players in the world to never win an event. That tortuous trend has continued in 2016, as Naded (along with his team, Allegiance) has been defeated in tight semifinal matchups at both the X-Games and NA regionals. Allegiance’s solid gameplay has been good enough to get far in tournaments, but they’ve yet to display championship-level performances when they needed to. Unfortunately, I don’t see things going differently at the Halo World Championships. It’s hard to imagine anything more than a semifinal finish, and I frankly wouldn’t be surprised if they were upset before then. How can you not fall in love with Walshy’s goofy grin? One of the things that surprised me when I first began watching Halo eSports was how much quality commentary added to the overall experience. Past Halo pros like ‘Walshy’ have made the transition to broadcasting surprisingly well, and Chris Puckett adds a smooth professionalism to the team. Their reactions (combined with crowd reactions) to intense moments really adds to the viewer’s experience, and their in-depth knowledge of the game also allows them to offer critical analysis to more invested fans. For the less-experienced viewers, the commentators do a great job of explaining some of the basics of various game-types, objectives, and strategies so that the experience is still accessible to, say, my partner who’d never played Halo in her life (until she was inspired to try it after watching the NA regional tournament!). It’s kind of impossible to talk about Halo eSports these days without mentioning the intense rivalry between top teams Evil Geniuses (EG) and Counter Logic Gaming (CLG). These two teams have been rivals for a while, so you can only imagine the drama when a member of EG (“Lethul”) left the team to join CLG just days before the Winter X-Games event. EG barely managed to get revenge with a tense finals win, but Lethul and his new team absolutely decimated EG in their NA regionals matchup. This weekend, expect more rivalry narrative between these two teams with a new twist: EG will be considered the underdog for the first time in months. North American regional champions, and it wasn’t even close. Look, at this point there’s really little argument as to who is the best team and favorite to take home the $1 million grand prize: Counter Logic Gaming (CLG). After their down-to-the-wire 2nd-place finish at the X-Games event, CLG put their heads down and practiced with a new fervency until the NA regional tournament, and boy did it show. They crushed foes on their way to winning the regional tournament in clinical fashion. Since then, they’ve been scrimmaging against other pro teams nearly every night, and the result is always the same: crushing victory. I’m talking undefeated-through-a-13-game-series crushing. It’s hard to imagine any reasons why this success won’t continue in dominating form at the Halo World Championship. ... except maybe one. Experienced competitors of any sport can tell you that one of the biggest enemies of success is a sense of complacency, especially once you’ve reached big milestones or goals. Conversely, responding properly to adversity can help you grow and reach new competitive heights. This dynamic seemingly played out after the Winter X-Games event: while CLG quietly re-focused, EG players seemed to bask in the glow of their win. After EG’s humiliation at the NA regionals, I wonder if this script has been reversed. CLG has continued to dominate their scrimmages, but I question how much they’ve felt pushed to grow and improve. I’ve watched a lot of their scrimmages (they stream them nearly every night), and their wins have had a lazy expectation to them. In contrast, EG’s demeanor and approach incredibly intensified after regionals, and they eventually stopped streaming their scrimmages altogether to better prepare. I’ve seen CLG lose one series over the last three months, and it was in a high-stakes matchup that was closely competitive. It’s been awhile since they’ve found themselves in a similar situation, but they will at least once this weekend. On the biggest stage with the highest stakes they’ve ever experienced, I can’t help but wonder how prepared they’ll be. What are you all looking forward to this weekend? Any predictions for the tournament? Let’s chat in the comments! If you want to follow my live thoughts on the tournament (and other super-important things), you can follow me on twitter @aFreudianTrip.